For today's post I teamed up with TCP to share with you some of my favorite items this season. It is no secret that I love the dress up my kids and I like to do it in style. I headed to my local The Children's Place store and picked up a few outfits for my son. This was definitely one of my favorite looks. I love cool and comfortable outfits for both of my kids. And for back to school I am all about comfort and versatility. I love this Lego lunch bag! It's so fun and colorful, it matches with everything. And if you know me, you know I love high top shoes for B. They are my favorite, he has more than a few pair and I had to get these which were less than $25! What I love most about The Children's Place is that they have a great variety and fit everyone's budget. One little consumer tip I want to share with you is to always google coupons at your favorite stores! On this little shopping spree I was able to find an extra 25% off coupon online and saved over $50 on my $200 purchase! I still have to get supplies this week but I am almost done and we are ready for a new school year! I hope all your kiddies have a healthy and happy school year. I hope my B doesn't cry on the first day of his new school. I think I will cry more than he will. I am such a sap. I love these little signs that The Children's Place along with Shutterfly have designed for our kids! Get yours HERE! They are super fun and cute and just perfect for the first day of school pictures! Back to School season is here – and The Children’s Place is teaming up with Shutterfly to help parents create a keepsake for their children’s First Day of School photos. Now through Saturday, September 12th, you have the opportunity to receive a custom coupon code for $20 off a purchase of $20 or more at Shutterfly.com! To receive the code, simply share a First Day of School photo on Instagram, Twitter or Facebook – using #FirstDayPLACE and tag @ChildrensPlace! Limit of one Shutterfly offer per account. 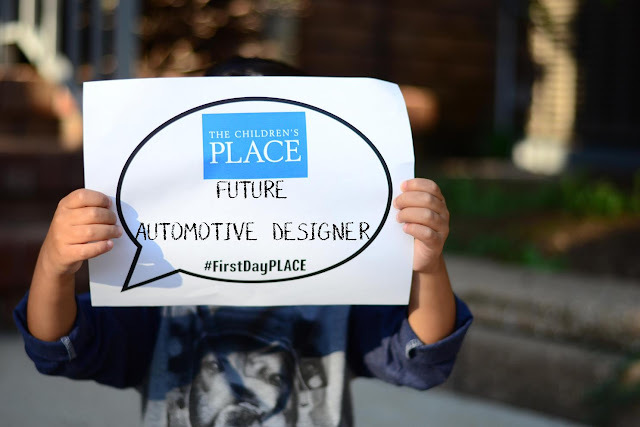 · For photos uploaded on Instagram or Twitter, simply use the hashtag #FirstDayPLACE and tag @ChildrensPlace. P.S. If your account is private, we won’t see it! I can't believe Back to School season is already here! Where did summer go exactly? My son is starting pre-k 4 and I am already so emotional. He has been in school since he was two and a half but this year he is attending a whole new school and I am nervous but mostly excited for him. I've been picking up pieces here and there for this school year, of course at my favorite stores. One of them is The Children's Place! Which is why I was so excited when I was asked to join in for this collaboration. Back to school outfits are so much for to pick out and I love everything we got! What have been your favorite stores for Back to School shopping this season?